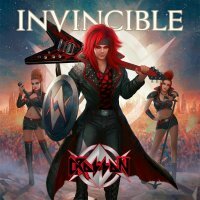 The Australian band are back with the follow up to their 2016 album 'Spreading The Rock 'n' Roll Disease', and this effort 'Invincible', in the same way, is the brainchild of bandleader and founder Jason Crosson. The publicity surrounding this album describes the content as "Futuristic Theatrical Rock", and whilst one can't argue with the "Theatrical" part of that statement, I would question the "Futuristic" bit. It's certainly dramatic in places, but not always for the right reasons. Musically the album is fine, but to my ears it's let down by average vocals and cheesy eighties lyrics. The opening track being a case in point, as 'Rock Warriors' allegedly pays tribute to all the bands and artists that laid the foundations of the music we love, but it sounds like it was written back in the day and, come to think of it, recorded back in the day as well. Most of the songs on this album would pass comfortably on the West End stage as part of a Rock-style production, but few are memorable and the album is only really saved when Finnish vocalist Jessica Wolff joins the outfit for a duet on 'Unconditional Love'. I am led to believe nothing can prepare you for the visual onslaught Crosson delivers in its live show. "Numerous costume changes, blended with high-energy choreography, smoke, sirens, and catchy Rock anthems makes the Crosson live show a seen-to-be-believed entertaining experience". Perhaps that makes up for a very average album. A fellow Rock journalist who I know well once said "If you like the of idea of Kiss and Mötley Crüe crossed with The Darkness and Steel Panther, you're gonna love Crosson". I rest my case!